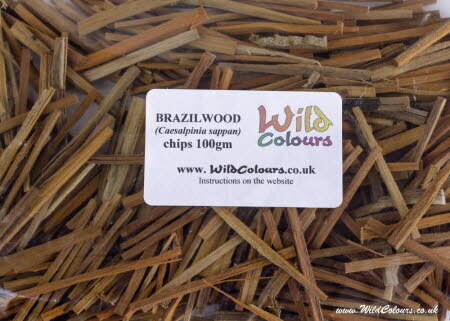 Our brazilwood chips are from India. Navigate to "Red Dyes" > "Brazilwood" to read more about its history and biology and for instructions on how to dye with brazilwood. Adding chalk (calcium carbonate) can make a big difference to the colour of your dyed fibre. Chalk brings out red and crimsons with sappanwood. Brazilwood chips are similar to matchsticks in size and cut to about 5cm in length and 2 to 3 mm square in cross-section. They are weighed and sealed in a polythene bag. The bag is then labelled, placed in a padded envelope and posted to you First Class. We hope you enjoy achieving beautiful reds and crimsons with this traditional natural dye.